When I was growing up, every July around the 4th, or thereabouts, my Dad would announce that it was time to pile the entire family into the big, blue family station wagon and head for Lockport, NY for the annual cherry picking outing. Now I adore cherries, especially the big, firm crunchy Bing variety, but picking bushels of them as a child was beyond annoying. Ours was a large family and my dad, being the generous and kind man that he was, took it upon himself (with the aid of child labor) to bring aunts, uncles, and grandparents a goodly amount of cherries. That meant we spent the day climbing on ladders and hanging on tree limbs to get the best ones. I hated this job. To this day, when the first local cherries appear in the grocery store, I say a small prayer of thanks that I didn't have to pick them. One year as a rebellious teenager, I decided there was no way I was going to be seen picking cherries. When the dreaded day arrived, I conveniently hid in my closet until the rest of the family was gone and then I settled in for a relaxing day of nothing to do. Later, when everyone returned, I got the cold shoulder for not doing my part, and was denied access to the cherries! Eventually all was forgiven and I sat on the back porch with everyone else munching away, but the lesson was learned. You want the cherries, you have to chip in! 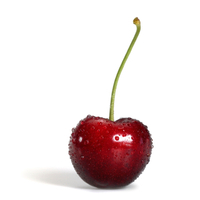 These days most of the cherry crops come from Michigan. While the season is short, I make the best of it by buying large quantities to keep in the fridge. You can be sure I'll use a good sized portion to make one of my favorite desserts, cherry chocolate tiramisu. As for you, I recommend you get to your favorite produce store, grab a handful, and find a hammock, because in the blink of an eye, they’re going to be gone.